This is my first Jack London story though I did read an alien invasion short story which declared to be written in his style. 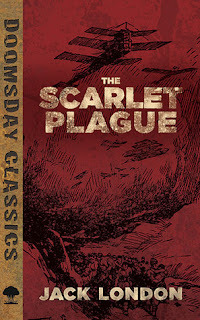 The Scarlet Plague was first published over a hundred years ago and though set in 2073, describes our "current times". For a tale a century old London describes the quick degradation of our society in a dark and straightforward manner. There have been enough post apocalyptic novels written in the meantime that the general themes and actions of people falling upon each other in times of trouble still stands. I also found it interesting how a story set a hundred years ago pictures the technology of today and gave the old man's past a steampunk feel. His descriptions of "talking through the air", simplified for his audience of "savage" grandsons could easily be tech today or in a spec/fic steampunk world something else entirely. The story is short but definitely fits as post-apocalyptic and is a nice addition to Dover's Doomsday Classics collection. If you expect anything post-apocalyptic or dystopian to have a spunky, tough teenage girl at its centre or if you rail against misogyny in all forms and can't see past it even in a work created in a time when it was far more prevalent than it is now then this might not be for you. If you like the genre, definitely take this one on. As a reader, I feel it's important to go back and experience classics in my favourite genres. Not just to see how they were different, but to see how the genre has grown and which things about them continue to make the genre strong and popular. Guest Interview with Donna Maree Hanson!